We host Birthday Parties, Private Parties/ Girls Night Out, Sewing Group Space Rental, Anita Goodesign Parites, Special Educators, and host booths at Quilt Shows. Schedule your Girls Night Out Infinity Scarf Parties! *included fabric and supplies for two scarves. No experience needed. Invite friends, co-workers, family or neighbors. We will provide machines unless you have your own. 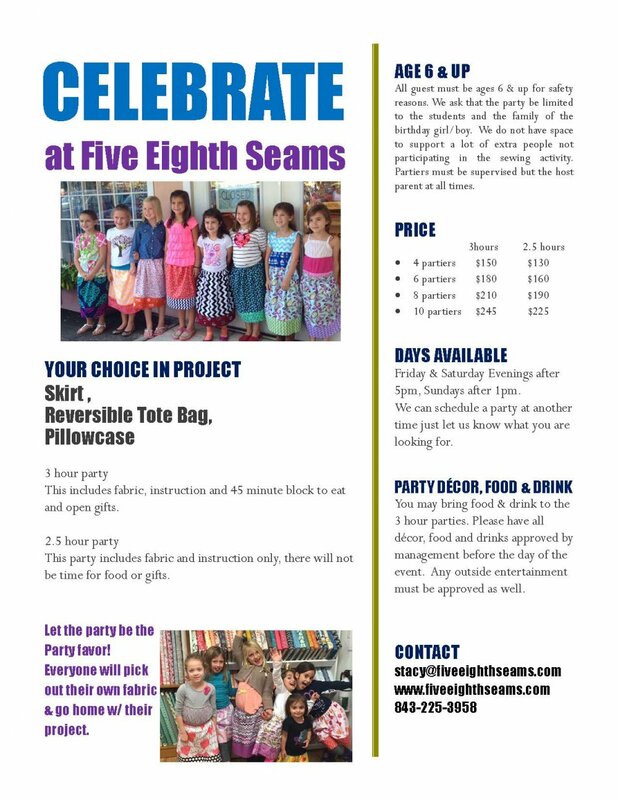 BYOB- bring beverages and snacks for a fun social night at Five Eighth Seams! The class is perfect for anyone interested in learning how to sew, have never had formal instruction or are new to machine sewing.